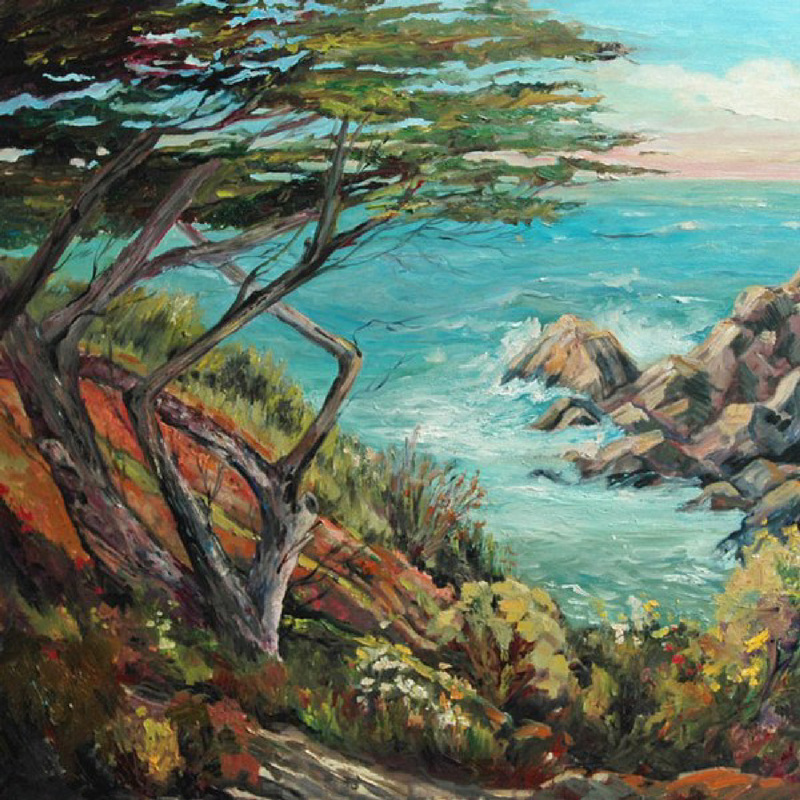 Marjorie Kinney paints outdoors, "en plein air" as the French say, as well as taking reference photos in her travels to paint “en studio” on her return. "I want to be there" is often the response of viewers. Favorite subjects are coastal landscapes, flowers, mountain scenes, and abstract expressionism. 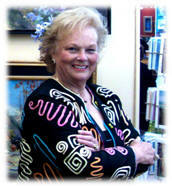 She has painted for over 28 years with oils and acrylics. 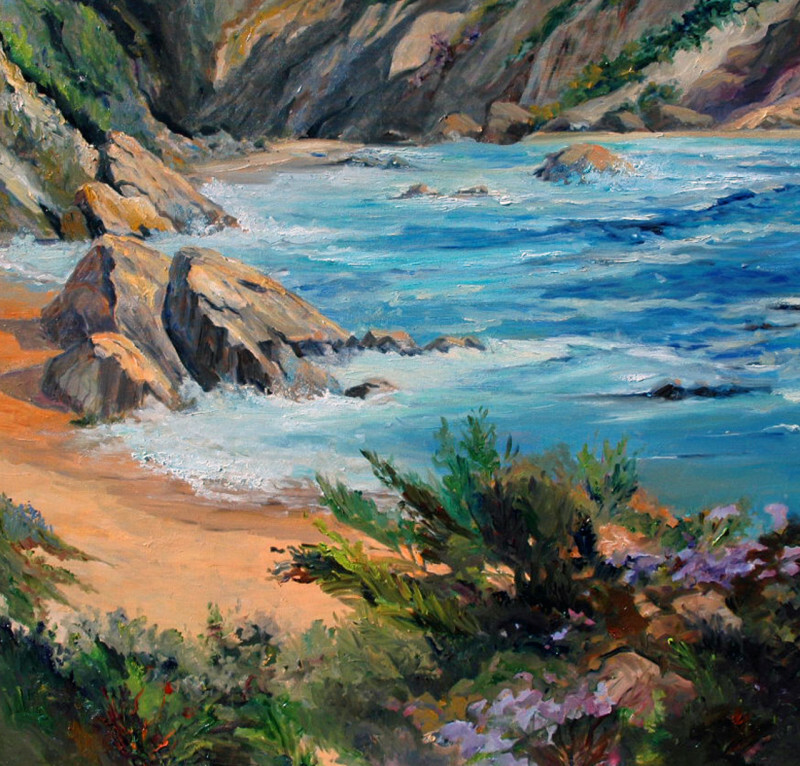 Marge paints landscape and seascape oil paintings near Laguna Beach, Dana Point, Newport Beach, Balboa Island, Monterey, Carmel, Lake Tahoe, San Diego and throughout the Southern California, Orange County region. Her full palette of romantic colors speaks for the picturesque days she spends painting "en plein air," the French word for painting on location. Marge's paintings are often likened to Monet or other famous impressionists who also painted en plein air, however the symphony of bright colors in her painting style is derived from the way light waves cross the Mediterranean belt which extends across Southern California skies. Marge exhibits at the nationally famous, juried Art A Fair Festival and The Balboa Island Art Walk of Fine Art. The Art-A-Fair Festival runs from June through August at 777 Laguna Canyon Rd. in gorgeous Laguna Beach, CA. It is located just two blocks from the main beach and ocean and is across the street from the Festival of the Arts and adjacent to the Sawdust Festival. There are 130 top artists who exhibit at the Art-A-Fair Festival from all over the world. The Balboa Island Art Walk takes place in May along Bay Front Ave, on Balboa Island, in Newport Beach, CA. The Balboa Island Art Walk features fine art with approximately 100 artists from the local region. It is a great show! Guest artist at the House of the Americas and Museum for Women Artists in Washington, D.C.
Pimpernel Ltd. UK -licensed 12 images for world distribution in 21 countries. Since 1992 Marge has appeared at South Orange County Hotels to conduct Art Classes, Art Tours and to provide Interactive Art at opening night receptions. They include The Ritz Carlton, Montage, St.Regis, Pelican Hill, Marriott Cliffs and Huntington Beach Resorts. Marjorie Kinney was formerly in corporate business for many years and served for many years on two Fortune 50 Boards of Directors. She has an MBA from Pepperdine University. Picasso said, ” The meaning of life is to find your gift, the purpose of life is to share it”. For years I have sought out new ways of expressing my natural restlessness. Painting has been a mainstay of my activities for 28 years. I am still passionate about painting coastal landscapes and find traveling to new coves or seascapes stimulating. I try different styles, particularly contemporary abstracts, but return to landscapes as my main interest. She has four grown sons. American Association of Construction Lawyers; Biotech, 3M, Marsh-McLennon, Sun Microsystems, Lenox, Pharmacia, Parke-Davis, Steel Services Assn., Bank of Canada, National Assn. of Broadcasters, Produce Marketing Assn, Renaissance, Marriott, Merck, Pfizer, Financial Network, Fujikawa,. Volvo, B of A, Biotech companies, to name just a few.